Rock Pikmin (岩ピクミン?) are a species of Pikmin featured in Pikmin 3. They resemble small polished rocks with Pikmin eyes, limbs, and, just like the Winged Pikmin, have lavender flowers. The main part of their body seems to be a gray texture of graphite that reflects light, whereas their stem, arms, and legs appear to be smooth and gray. 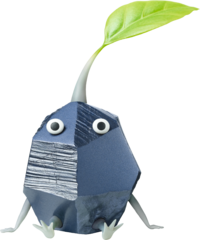 When Rock Pikmin are dismissed, their sprouts glow gray. Their ghosts are also shaped like small gray rocks with eyes. Just like all other types of Pikmin in Pikmin 3, Rock Pikmin have an Onion, which later in the story merges with the Master Onion, and are reproduced through collecting nutrients from pellets and corpses. Rock Pikmin are the second type of Pikmin Alph discovers in Pikmin 3, the first being Red Pikmin, and can be found in all of the game's modes. The Rock Pikmin showing their resistance to crushing. Rock Pikmin, like most Pikmin types, are immune to a specific hazard. These Pikmin, in particular, are immune to blunt force; when crushed by a large object, they are simply driven into the ground and become temporarily and partially buried. When a creature with a sharp proboscis tries to impale them, they are simply knocked back without taking damage. This immunity has been removed in Hey! Pikmin, for unknown reasons, as proven by the Crystalline Crushblat. Rock Pikmin have very hard exteriors, which allows them to smash through glass, crystals, and even the armor of larger animals (like the Armored Mawdad and the Peckish Aristocrab's claw). However, they do not sink in water, and are thrown just as far as most Pikmin types, revealing that they do not weigh much. The damage caused by a thrown Rock Pikmin depends on the creature, but in general, stronger enemies take more hits to bring down, and some smaller creatures, like Dwarf Red Bulborbs or Skutterchucks can be dispatched with a single Rock Pikmin throw. Despite their increased strength, they do have a setback: Rock Pikmin cannot latch onto their targets like other Pikmin and will instead bounce off and roll back. If left unoccupied, they will repeatedly attack enemies and obstacles by charging head-on into them, doing significantly less damage per time than other Pikmin types: after hitting something, they roll back and stay lying down for a bit before rushing again, making their rate of attack atrocious. On top of that, they only cause 20 points of damage, which is quite weak for how often they attack. For some reason, when Rock Pikmin are told to charge, they cause even less damage when they lunge, serving only 10 points of damage. Although, after they get up from a charge, and are left to lunge by themselves again, they will cause 20 damage, like a normal lunge. As such, the best way to attack with Rock Pikmin is to have leaders throw them, which causes more damage than a regular lunge, and to whistle them to get up from lying down faster. That said, if they are thrown at the root of a Burgeoning Spiderwort and not directly on its berries, are told to attack the Shaggy Long Legs's hair, or are attacking another Pikmin in Bingo Battle, they will cling on like the other Pikmin types, and they won't lunge (they will lunge when attacking a leader in Bingo Battle, though). The Rock Onion encased in crystal. The Rock Pikmin are discovered in the Garden of Hope, the second area in Pikmin 3. They are found in a cave located north of the landing site. Residing in this cave is a Medusal Slurker that contains 6 Rock Pikmin. After defeating it, the player can use the newly-discovered Pikmin species to free the Rock Onion from a large crystal. After propagating some more Rock Pikmin, they can be used to break down the crystal wall outside of the cave and free Brittany. At the end of the day, the Rock Onion will merge with the Red Onion. Interestingly, a few of the Rock Pikmin inside the Slurker will have a bud on top of their stem while others will have the usual leaf. To do: Finish the list for mandatory and recommended uses. Searing Acidshock (Garden of Hope): One of the two in the area is inside of a crystal. Quaggled Mireclops: The crystal on the head must be destroyed to finish the first phase of the battle. Rock Pikmin Onion: As stated above, their Onion is encased in a crystal that needs to be destroyed in order to release it. Rock Pikmin are recommended for the following tasks, but are not mandatory. Fire-Breathing Feast: This piece of fruit is located inside the Armored Mawdad. Although leaders can defeat the creature by punching it (even with its armor), using Rock Pikmin is much faster. Disguised Delicacy (Distant Tundra): This fruit is encased in a crystal. It is possible to destroy the crystal with bomb rocks. Zest Bomb (Distant Tundra): This fruit can be found inside a crystal. Bomb rocks could also be used to destroy it. Dapper Blob (Twilight River): This fruit is encased in a crystal and guarded by two Yellow Wollywogs. However, bomb rocks can be used to destroy the crystal and other Pikmin types can defeat the Yellow Wollywogs. Blonde Impostor: This fruit is encased in a crystal. However, bomb rocks can be used to destroy it. Searing Acidshock (Tropical Wilds):The one in Tropical Wilds is inside a Calcified Crushblat. Yellow Wollywog: This enemy's only attack is crushing Pikmin, which Rock Pikmin are immune to. Joustmite: This enemy's only attack is stabbing Pikmin, which Rock Pikmin are immune to. Armored Mawdad: Rock Pikmin are needed to destroy the crystal armor, but the creature can be defeated if leaders punch it. Calcified Crushblat: Although the creature is covered in crystal, a bomb rock can destroy it. On top of that, Winged Pikmin can charge at its feet, removing the need to take out the crystal. Peckish Aristocrab: The claw can be destroyed to make it unable to eat Pikmin, but this is not necessary. Plasm Wraith: The crystal Elemental Plasms it releases can be destroyed by Rock Pikmin, but destroying them is not needed to win the fight. Its main attack, where it stabs and eats Pikmin, will not affect Rock Pikmin. Skutterchuck: The crystal nodules it uses to attack can be destroyed to make the enemy more harmless. Shaggy Long Legs: Rock Pikmin are extremely helpful in this fight as they are immune to being crushed and they can climb up the Shaggy Long Legs. Crystal wall: Crystal walls can be destroyed with bomb rocks, but it is much easier and more efficient to use Rock Pikmin. Crystal: Like crystal walls, it is much easier and more efficient to use Rock Pikmin instead of bomb rocks. They deal 20 damage when lunging by themselves. They cause 10 damage on a charge's first attack. The thrown damage depends on the enemy (refer to the "Technical information" sections for more information). Interestingly enough, when charging towards a gate, a Rock Pikmin will deal the same amount of damage as when thrown. Rock Pikmin are not a part of Olimar's moveset in Super Smash Bros. for Nintendo 3DS and Wii U, but they do appear as a trophy. “These Pikmin are made of solid rock, so they can stand up to a lot of attacks and won't get hurt when they get stepped on. They specialize in body blows, dealing a lot of damage when thrown, and they can also break right through glass and crystal. They can't latch on to other creatures, though. But that's OK—nobody's perfect! “These Pikmin are made of solid rock, so they can stand up to a lot of attacks and don't get hurt when they get stepped on. They specialise in body blows, dealing a lot of damage when thrown, and they can also break right through glass and crystal. They can't latch on to other creatures, though. But that's OK – nobody's perfect! In Super Smash Bros. Ultimate, Rock Pikmin appear as a spirit and can be seen being freed in the True Ending cutscene. A few Rock Pikmin in the Garden of Hope. Finding the first Rock Pikmin. Alph throwing Rock Pikmin at a crystal wall to break it. A Rock Pikmin buried after being crushed. The Medusal Slurker holding some Rock Pikmin. Rock Pikmin viewed from the KopPad. Artwork of the Rock Pikmin from the Official Nintendo Magazine. Concept art of the Rock Pikmin in Pikmin 3. A group of Rock Pikmin in an E3 2012 screenshot. A Rock Pikmin constellation on the day selection screen. The data file explaining Rock Pikmin's crystal-shattering hardness. The data file explaining Rock Pikmin's power upon impact. The data file explaining Rock Pikmin's immunity to crushing. The three stages of a Rock Pikmin. Artwork of Rock Pikmin walking. Another concept art for the Rock Pikmin. A Rock Pikmin shaking after leaving the water. To do: Describe the "crunching" sound better, and note which enemies make the noise, and which do not. In the happy ending of the first Pikmin game, there are four black or gray Pikmin Onions flying above the planet's atmosphere. These could quite possibly be Rock Pikmin Onions, even though the Onions' appearance in Pikmin 3 has changed. In Pikmin Adventure, the Knuckle Seed resembles the ability of Rock Pikmin: a straight and strong impact shot. Rock Pikmin release "cracking" particle effects for when they hit breakable objects. The stem on a Rock Pikmin's head droops lower than on other Pikmin types. Rock Pikmin are the only main Pikmin type not to be utilized by Olimar in the Super Smash Bros." series in any way. As seen in this trailer, Rock Pikmin originally had four looks. In the final game, all Rock Pikmin look exactly the same. Rock Pikmin make a different sound when eaten: there is a much more noticeable crunching sound. This is easy to hear in the Garden of Hope because a Bulborb is near the landing site. Even though they supposedly have a solid body, they still stretch and twist when plucked or when they shake off water. After being thrown, Rock Pikmin bounce a little when landing, but this is not the case when they are thrown on a lily pad, an elevator platform, or a cardboard box. This is likely to stop them from falling off. Rock Pikmin have bigger leafs, buds, and flowers than other Pikmin types. Purple Pikmin also have this quality. This page was last edited on February 7, 2019, at 16:19.